Many people think of Labor Day as the unofficial end of summer, a last chance to relish barbecue and the outdoors. However, the origin of Labor Day goes back to 1885 when the day was first observed to honor the achievements of America’s workers. So in addition to firing up the grill this holiday weekend, why not spend some time celebrating your Kissimmee senior parent’s or grandparent’s professional achievements? Whether he or she was a teacher, soldier, or homemaker, asking questions and creating a life story can provide a meaningful and memorable way to spend time together. After making sure your Kissimmee seniorparent or grandparent is open to it, set aside some time to sit together and ask about his or her career. There are a number of ways to do this. You might give a curious grandchild the assignment to act as a “reporter” for the day, coming up with questions to ask Grandma or Grandpa about education and work. Or, you might simply gather the family around for a casual conversation. In order to make this a positive experience for all, make sure to tailor your questions and approach to be sensitive to your Kissimmee senior parent’s needs. For instance, a long list of in-depth questions won’t suit a senior with cognitive impairment. Further, some war veterans may shy away from discussing their experience in detail: monitor their reactions throughout the conversation and gently guide topics to suit. 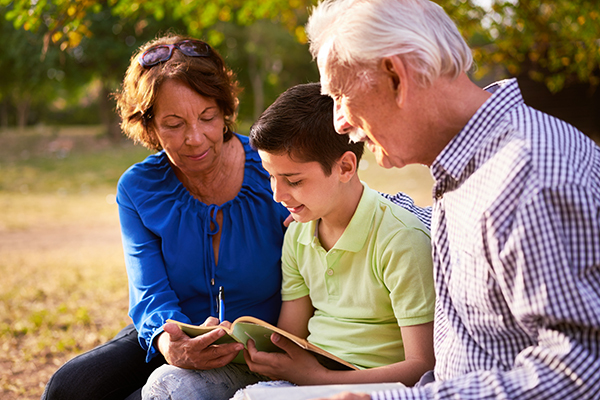 When the life story is complete, spend some time looking over it with your Kissimmee senior parent. The exact timing of this is flexible: you might have the initial conversation on Labor Day and present the life story later, or you could have the conversation in advance and present the life story on Labor Day. However you plan it, think of this as an opportunity to learn more about your loved one and show them that the work they’ve done is important and appreciated. BrightStar Home Care of Kissimmee and Brevard & Osceola Counties proudly provides support for the elderly and children, including 24 hour skilled nursing and support in senior independent and assisted living communities. Additionally we provide Medical Staffing and In-Home Physical Therapy for pediatric, adult and geriatric patients, Companion and Personal Care for Elders with Alzheimer’s or Dementia. We also provide Home Child Care, Sitter and Nanny services for Children and Support for New Mothers. We Support Veterans and Accept most Long Term Care Insurance benefits, provide Hospice care, Live-in care, CNA, Caregiver, RN, LVN, RN Supervision, Compassionate Care, and Compatibility Guarantees. Other services include safe discharge and transportation from the hospital or rehab facility, Post Op care both short and long term, Pre Operation and preparation help and assistance, and client monitoring for out of town family members. BrightStar of Kissimmee / Osceola proudly provides child care and senior care in Osceola County, including Kissimmee, Celebration, Saint Cloud, Poinciana, Poinciana Place, Campbell, and Buenaventura Lakes in Fl.